Voting is your opportunity to have a say in the leaders and the laws that govern us. Here’s some information on how to vote in November’s midterm elections. Registering to vote is the all-important first step in participating in the voting process. Non-Colorado residents can consult their home state for voter registration information. You might consult your home state’s information if you’re attending ASU, but you still consider your family’s address in another state to be your permanent address. *If you aren’t already a Colorado resident, review the residency requirements and prerequisites for any financial aid or scholarships you may have before you consider registering to vote in Colorado. If you have a current Colorado driver’s license or ID card, online here! Colorado voters can vote either by mail-in ballot or in person. To receive a mail-in ballot by mail, you need to register to vote by Monday, October 27. If you plan to vote in person, you can register to vote any time up until election day. If you vote in person, you’ll need an acceptable form of identification. The polling place (where in-person voting happens) for Alamosa County is the Alamosa County Clerk and Recorder’s office. NOTE: the Clerk and Recorder’s office has moved and this information is not reflected on the website. The new location is at 8999 Independence Way. Not sure how you’ll get down there? 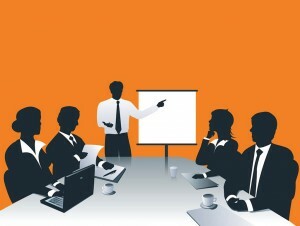 Like Free Journal Articles? 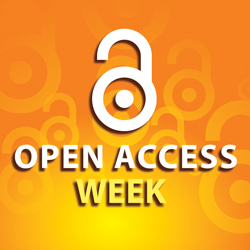 Celebrate Open Access Week! Ever click on the PDF for a journal article you want, only to find it you must pay a fee to access it? Open Access is a movement supported by libraries, publishers, and individuals who would like to erase those fees, making research available to everyone. Journals that participate with open access standards provide some or all articles for free (Gold Open Access) and researchers who participate in open access standards provide free prints or preprints of their article in an online repository (Green Open Access). For an example of Gold Open Access please see the Public Library of Science journals. For example of Green Open Access search the vast theses and articles deposited in MIT’s institutional repository D-Space. Curious about Chromebooks? Ever wonder what it’s like to read on a Kindle? Unsure about the smartwatch phenomenon? The Nielsen Library now has a wide variety of different gadgets and devices for you to check out. We have tablets, eReaders, a Chromebook, smartwatch, smartpen and more! Most devices check out for 2 weeks, so you can try before you buy or just get more familiar with the latest technologies. The library also has laptops, headphones, and phone chargers. All technology can be checked out from the circulation desk on the first floor. For more information, including a complete list of devices and lending policies, see our Technology Collection webpage. The Maynard Adams Book Talk scheduled for this Friday has been cancelled. We apologize for the inconvenience. 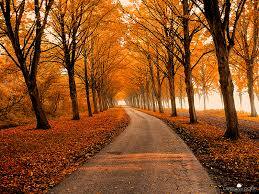 Normal hours will resume on Sunday, October 19. 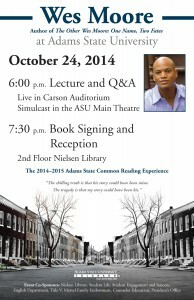 Have you read The Other Wes Moore: One Name, Two Fates, the 2014-2015 ASU Common Reading book selection yet? 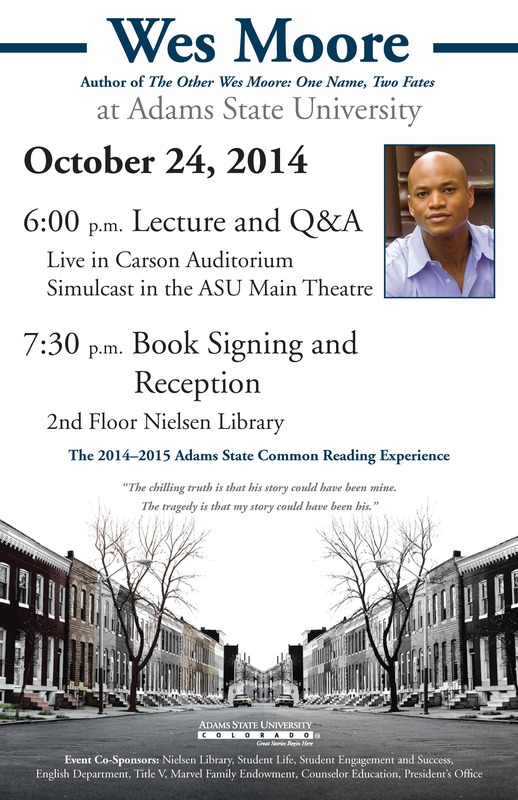 If not, there’s still time to read it before author Wes Moore visits Adams State on October 24th. The Nielsen Library has three copies on reserve – you can request them at the circulation desk. On Tuesday, October 21, 6:00pm – 7:00pm, we will be hosting a book discussion on the first floor. 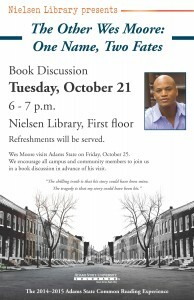 Come ready to share your thoughts about The Other Wes Moore! On Friday, October 24, 7:30pm, we will host an author reception and book signing on the second floor of the library. 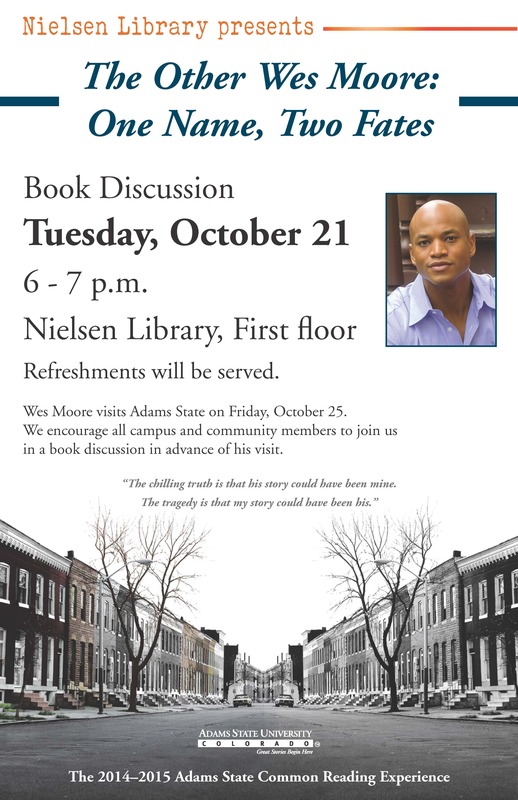 This reception directly follows Wes Moore’s talk in Carson Auditorium at 6:00pm. Refreshments will be served at both events. 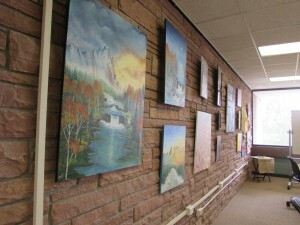 The Nielsen Library will be hosting a Domestic Violence Awareness Month Art Exhibit for the entire month of October, with an opening reception on Friday, October, 3 from 4:00pm-6:00pm.